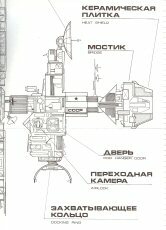 • Module SF-0: Crash on Volturnus (30 pages) with cover folder/map. 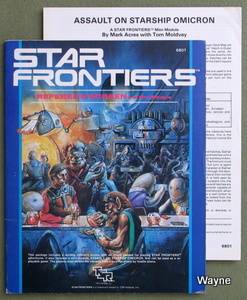 Star Frontiers, when it was introduced by TSR in 1980, was a conscious break from the AD&D standard. The rules were entirely different (percentile-based), and the presentation was good. Unfortunately, it didn't garner sufficient popularity in the gaming community at the time of release, and was discontinued by the mid-Eighties. This is the Basic Set, with two rule books, an introductory module, SF0 - Crash on Volturnus, poster map, and counters. 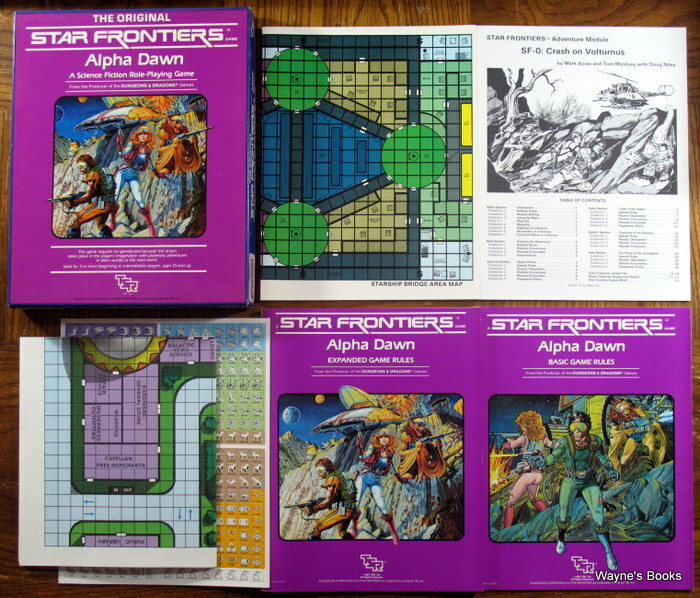 A later printing (1983) of the boxed set was labeled "Alpha Dawn." 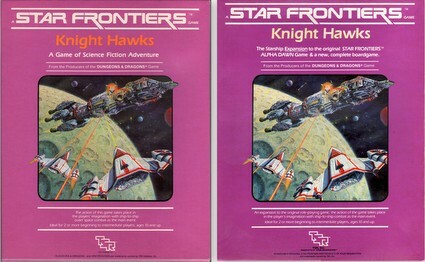 and printed in the same format as the Knight Hawks starship combat set. 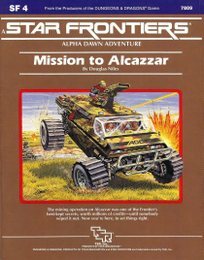 A more starship-combat-oriented addition to Star Frontiers. First printing was in March 1983. 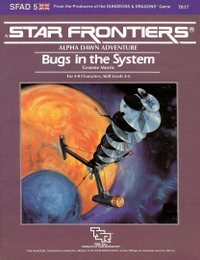 Second print was released in November 1983: The Campaign Book was renamed "Campaign Book Expansion Rules" and the box graphics were altered slightly. Includes "Assault on Starship Omicron" Mini-module (by Mark Acres & Tom Moldvay). For use with Alpha Dawn & Knight Hawks sets. You're trapped on the outer reaches of a frozen, desolate moonscape. Your parabatteries are dead, and your Stamina is at a new low. Suddenly, a flock of winged rippers swoops down out of the cold, starry sky. You reach for your Laser Rifle. But wait! You're out of ammo! Way to go, Flash. You forgot to use your character record sheets. 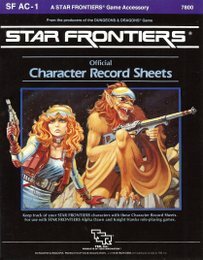 The new STAR FRONTIERS® Character Record Sheets will help you keep track of your character throughout all his space adventures. The sheets include room for ability scores, weapons, defenses, skills, equipment, and mission notes. A set of 32 records is provided in this package, along with tips on how to use them. 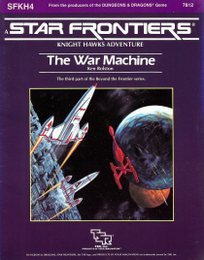 Room for recording spaceship skills, which are used in the STAR FRONTIERS Knight Hawks Game, is also included. Don't let your latest frontier be the final one. 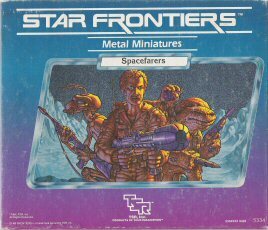 Carry on with the STAR FRONTIERS® Character Record Sheets, and boldly play where no man has played before." 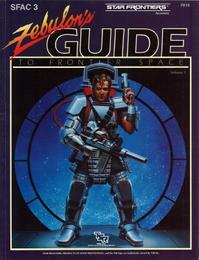 Zebulon's Guide should really be considered "Star Frontiers, 2nd Edition" - with many new rules and additions. The task resolution system went to a color bar results table, much like Marvel Super Heroes and Gamma World, 3rd edition. Also three new races were introduced: Osakar, Ifshnits, and the Humma. And Zebulon's Guide ends with a 2-panel detachable cardstock stellar map (this is often missing from used copies). "After decades of research, the University of Zebulon has published the first volume of its long-awaited guide to the worlds, beings, and technology of the Frontier. Compiled herein is the latest information on recently discovered races, star systems, worlds, and technology. Several unusual races have been encountered on the edges of the ever-expanding Frontier. These races are fully described and are now available as player character races. The boundaries of the Frontier have expanded in all directions. Recently discovered systems and worlds are described for the first time and the known worlds of the Frontier are given greater detail than ever before. Technology is being invented and discovered at an increasing pace. New weapons, defense systems, sensors, and a vast array of advanced equipment are now available to characters. This book also introduces a revised action resolution system that greatly enhances characters' combat skills while providing a single, easy-to-use method for resolving all character actions." "Volturnus: a barren, hostile world. When a pirate attack stranded your party of adventurers here, your luck and skill, and the help of the UI-Mor, enabled you to survive. The Kurabanda, a mysterious tree dwelling race, are your only hope of finding the lost explorers you seek. On this planet of mystery and danger, survival itself is doubtful. Are you equal to the challenge that lies ahead? 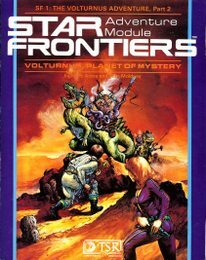 VOLTURNUS, PLANET OF MYSTERY is the second in the Volturnus series of modules for the STAR FRONTIERS game. 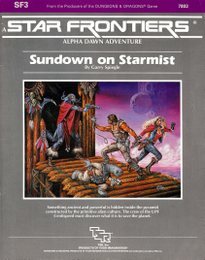 It can be played as a separate adventure or as a continuation of CRASH ON VOLTURNUS, included in the STAR FRONTIERS boxed game. VOLTURNUS, PLANET OF MYSTERY contains maps and referee's notes, as well as full information on several creatures and intelligent races inhabiting the planet. The Volturnus adventure will be continued in SF 2: STARSPAWN OF VOLTURNUS." Since you crash-landed here, Volturnus has been a planet of constant surprise and peril. You defeated the Star Devil's pirates and made contact with four intelligent races native to the planet. Your adventures with them made clear that these aliens would be valuable members of the UPF - if they manage to survive. The vicious Sathar are on their way to Volturnus with a fleet powerful enough to destroy all life on the planet. The survival of the planet is in your hands. You must organize the defenses of Volturnus. You must unite the races of Volturnus and lead them in battle against the Sathar. The outcome: victory, or death for an entire world! 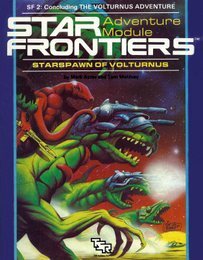 STARSPAWN OF VOLTURNUS is the conclusion of the Volturnus series of modules for the STAR FRONTIERS™ game. It can also be played as a separate adventure. STARSPAWN OF VOLTURNUS contains maps and referee's notes, including information on new creatures and intelligent races. The module also contains "The Great Game of the Ul-Mor," an encounter that can be used as a re-playable game." "Starmist! A new planet, discovered by a Vrusk merchant ship. A planet whose surface is a frozen waste crossed by giant canyons, kilometers deep. In those canyons are air, water, life, and above all, mystery. After an emergency landing on Starmist, Maximillian Malligigg, Second Officer of the VSS Centispeed, stumbled on a puzzling clue. While his fellow crewmen repaired the drive on their ship, Max made tentative contacts with the humanoids called Heliopes, who live on Starmist. The Heliopes are members of a primitive, nomadic culture. There is a single village among these nomadic tribes: a village whose people display excellent workmanship. In the village's center is a massive pyramid and an entire building complex set on platforms above the river. What did Max find that made him eager to hire you, an intrepid band of adventurers, to join him in returning to Starmist? What secret gave Max visions of wealth and brought you all to this golden rift and the promise of danger!" "You press against the steel hatchway, as the explorer bounds up the river bank, out of the water. Over the: roar of the engines comes the unmistakable whine of a high-performance groundcar. Quickly, you scan the horizon. At first the plain appears empty. Then you see them. 'Bandits at 11 o'clock. Three of them!' you shout into your chronocom. Instantly, the driver slams the heavy explorer into reverse, backing down the bank for cover. The rear doors burst open as Rocton dashes out to set up a heavy laser. Harradd, the Yazirian, follows right behind carrying five power beltpacks. Already someone is handing extra ammo up to you. At 80 kph, those ground cars are closing fast. Targeting the lead car, you squeeze the trigger and a rocket flashes out of the tube. At the same instant a shell streaks past you, exploding in the river and spraying steam into the air. You came to Alcazzar on a tough mission — it just got a lot tougher." The player characters investigate a troubled gas giant mining operation. For 4-8 characters, levels 3-4. "Venturi is a gas giant — a huge ball of gas that tried to be a star, but never quite made it. Now it just moans and grumbles and throws out magnetic storms once in a while. The atmosphere would suffocate you except that you'd probably freeze first, or be torn apart by the thousand kilometer an hour winds. You can't even land there because it hasn't got a surface, not unless you count an ocean of liquid hydrogen. But, we didn't let that stop us, not while there were all kinds of valuable chemicals swirling around in that gas-ball. That's where the jetson extraction platform comes in. It bobs around like a cork in the upper atmosphere, sucking in gas and distilling out the good stuff. Trouble is, there's something very wrong down there. I don't know what it is, but it's already cost eight good crewmen. Are you really sure you want this job?" The characters investigate events on the planet Kraatar, where racial tensions between humans and Vrusk threaten to plunge the society into civil war. For 3-6 characters, levels 4-6. "Today, the distinguished scientist and philanthropist Dr. Jack Legrange received the Fulborn-McCoy prize in recognition of his pioneering work in the field of bioengineering. The ceremony, held before an invited audience of renowned academics, however, was not with-out a whiff of scandal. Reliable sources close to the Awards Committee hinted to journalist that 'undue influence, had been brought to bear concerning the decision to award the prize to Dr. Legrange. After the award, Dr. Legrange was not available for comment, but an unofficial spokesperson for allegations were 'unfounded, and not worthy of serious consideration'. The ceremony itself was one to be broadcast to several worlds, but transmissions were marred by technical problems. Dr. Legrange departed from his published text and delivered an emotional attack on the Vrusk authorities of Kraatar. He spoke in particular of their 'ruthless exploitations of the human population'. Unfortunately, a power failure interrupted further broadcasts. We'll be back right after the break with the latest news on the Cassidine Zero-g ball game. 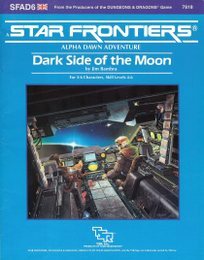 But now, a word from our sponsor..."
Dark Side of the Moon is a fast moving investigative adventure for use with STAR FRONTIERS Alpha Dawn game and can only be played with those rules. "Dramune! A system of conflict at the edge of the frontier. Its two life-bearing planets stand poised on opposite sides of an uneasy peace. Only the thin leash of one planet's democratic idealism prevents interplanetary war. Far across the galaxy, a dying captain carries an explosive secret. In his battered but swift freighter he hides a curious cargo. A cargo that will snap the leash preserving Dramune's peace. The captain has one last wish: to find a new crew and take his secret home. And he has one great obstacle: a notorious crime czar with a troop of slimy thugs. The odds are against the captain and his new crew, but together they must make this last voyage — the Dramune Run. 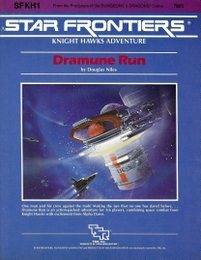 Dramune Run is an adventure designed for the STAR FRONTIERS game system, including the original role-playing game, Alpha Dawn, and its space-faring sequel, Knight Hawks. Both games are needed to play Dramune Run, which combines boardgame space combat with mystery, intrigue, and fantastic new characters for a thrilling science fiction role-playing adventure." Sitting in a burned out clearing, the survey ship Eleanor Moraes looks just like she did 45 hours ago. But now, most of her crew lies positioned in the thick alien brush around the clearing - silent and unseen. They're all tough and resourceful — experts in their fields. Onboard is the first officer, a skilled and determined Star Law Ranger — also a ruthless mutineer. He alone controls the ship's laser batteries and defense systems. He has just started the pre-launch ignition sequence. Within an hour, at most, the ship will lift off, stranding your expedition party. If he lifts off, chances of rescue are slim without the ship's subspace radio. Can your expedition party retake the ship? Or wilt you live out your lives on this hostile alien planet?" Years have passed since the end of the Sathar Wars, but skirmishes with Sathar raiders and infiltrators have continued. However, there has never been an opportunity to learn much about this wily and elusive foe — until now. Courageous volunteers are needed to carry the fight against the Sathar to the very edge of the unknown. The prize is a major Sathar base and, perhaps, a live prisoner: However, the least mistake will probably destroy the UPF strike force. A calculated risk, but well worth the gamble if successful. 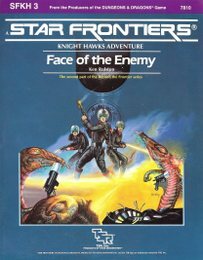 The Face of the Enemy combines the Alpha Dawn role-playing rules with the Knight Hawks space-faring rules. Both are needed for this module, which combines delicate negotiations and a daring boarding action in a rousing adventure for 3-6 players." As far as you know, no one has ever before captured an intact Sathar spaceship. You had one (until it blew itself up), and that makes you valuable property where the UPF is concerned. Clues from that Sathar ship hint that the Sathar have a base in the FS 30 system, an unexplored star system just beyond the Frontier sector. The UPF wants it checked out, and wants your group to do the checking. The trouble starts as soon as you arrive; fighter patrols, ravaged planets, mysterious messages, and slave camps are the unmistakable calling cards of the Sathar. Their war machine must be stopped at any cost; does that cost include you?" Unpainted. Includes Assault Scout (x2), Freighter, Frigate, Destroyer, Battleship. Rules pamphlet for playing Knight Hawks with metal miniatures. Unpainted. Includes Pirate Assault Scout (x2), Pirate Frigate, Sathar Frigate, Sathar Light Cruiser, Heavy Cruiser. 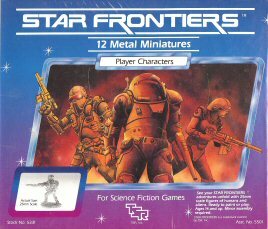 Set contains 12 metal miniatures: Sathar with rifle; Human (female); Dralasite with rifle; Human (male); Yazarian (flaps extended); Dralasite with pistol; Vrusk with grenade; Human kneeling; Vrusk with rifle;Yazarian crouching; Human with helmet; Sathar with mortar. Service 'bot; Security 'bot; Maintenance 'bot; Tank 'bot;' Hover 'bot; Household 'bot. 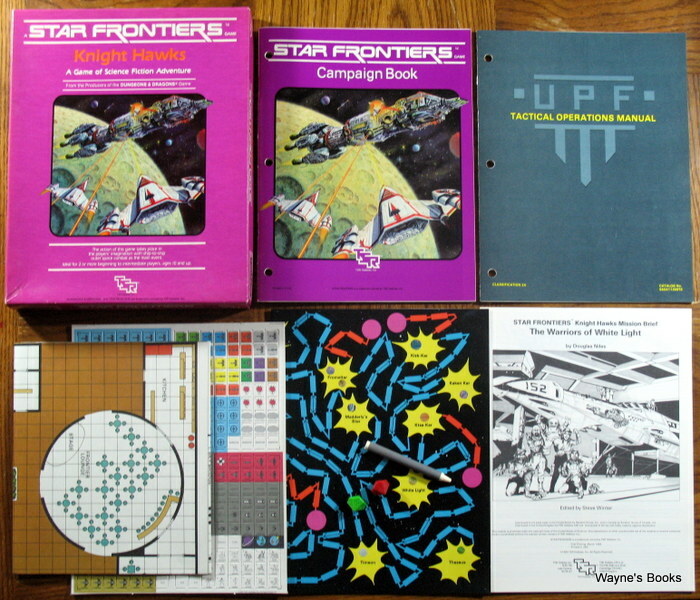 Fans of the Stanley Kubrick - Arthur C. Clarke joint venture (like myself) will enjoy these Star Frontiers accessories. They're full of maps, and true to the movies. Small tribes of feeble man-apes struggle to survive on the harsh plains dominated by vicious carnivores. Deep underground, an alien monolith stirs. Slowly, the great black slab rises out of the parched earth. The Dawn of Man has arrived! An unnatural magnetic field erupts near the Moon's largest base. Special teams from every major nation on Earth race to locate the field's source. Beneath the dry lunar surface, a monolith waits for its first glimpse of sunlight in 4,000,000 years! The USS Discovery hurtles silently through space, carrying its crew farther from Earth than anyone has journeyed before. Ahead lies a monolith over 2,000 meters long — key to the universe and the future! This module includes a large map sheet, pictures from the movie 2001, and new character skills! " 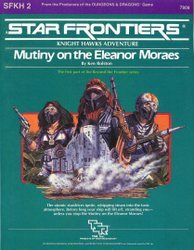 Written for the old Star Frontiers role playing game, this module has something for everybody. 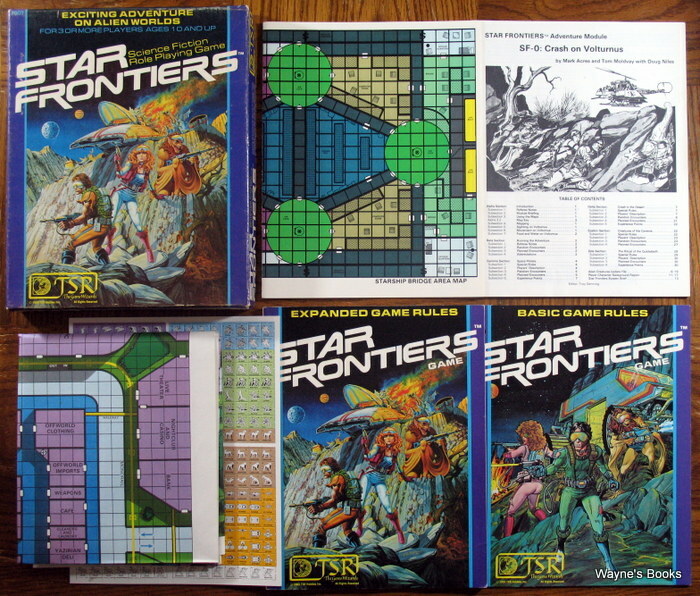 Gamers will find the skill-based, percentile rules of Star Frontiers easy to convert to more modern RPG systems. 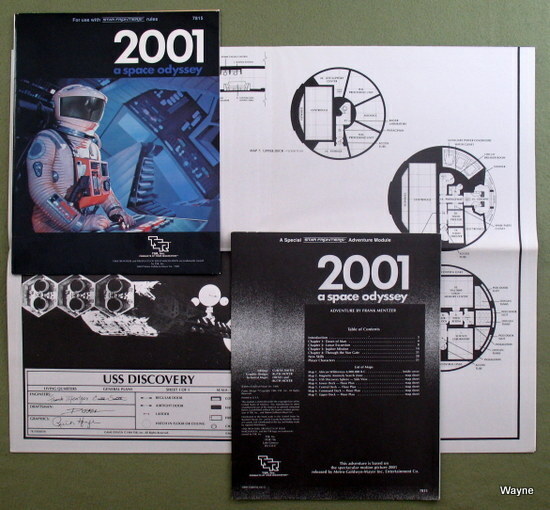 Non-gamers will enjoy the large sheet of floor maps of the Leonov and Discovery. "Seven-hundred million kilometers from Earth, an alien monolith glides silently above Jupiter. Thousand-meter-long plumes of flame and sulfur shoot up from volcanoes on a nearby moon, but never touch or scar the slab. Close by, the dark and lifeless spaceship Discovery tumbles end-over-end, abandoned since 2001. Now, in 2010, your ship arrives to complete the Discovery's mission: solve the mysteries behind the monolith. You must also determine what happened to the Discovery's commander, who disappeared into the monolith nine years ago. Then, if it's possible, you must repair the crippled Discovery and restart HAL, the super-computer that murdered most of the Discovery's crew. Unnoticed, the monolith stirs. It, too, has a mission, a mission prepared millions of years ago — and about to begin. This module includes a large map sheet, pictures from the movie 2010, and new character skills!" 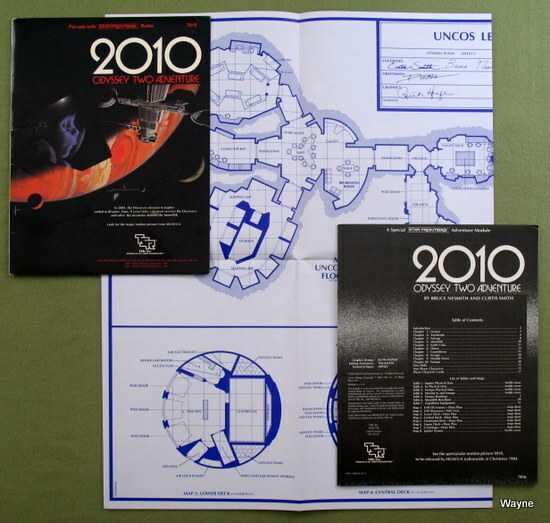 Set of 4 blueprints of the Soviet vessel Leonov from the movie 2010: Odyssey Two.